The right set of barn doors can transform a room or layer an additional depth to an existing decor. With the ideal barn doors you can use them in a contemporary, modern, rustic, beach and just about any style of home. Just because your home is a modern style doesn't mean you can't take advantage of this unique door treatment. You can create a truly dramatic doorway when you use a modern style barn door. This white panel door features a slightly frosted glass insert with three horizontal metal strips. The addition of the metal strips gives a nice finish that emphasizes the modern style. It's not enough to have a barn door, the overall effect depends on the style of hardware you choose for the sliding track. You can go subtle and elegant by using plain hardware or painting it. You can also make a bold design effect with wrought iron hardware in an arrow style. This design infuses the modern with a hint of a more rustic era reminiscent of a medieval door hinge. This kind of contrast is an excellent way to create greater interest and drama in your design. You may decide that a clear glass insert serves your decor better than a frosted one. You can also take advantage of the glass and use it as a blank canvas, ready to receive white, frosted or colored art decals for a more personalized touch. The starburst barn door design is a classic design and also known as a Double Z design. Many of these very large doors are often used as a single door. When this is done, the door is simply known as a Z design. The Z design features a Z on the upper panel and a reversed Z on the lower panel. 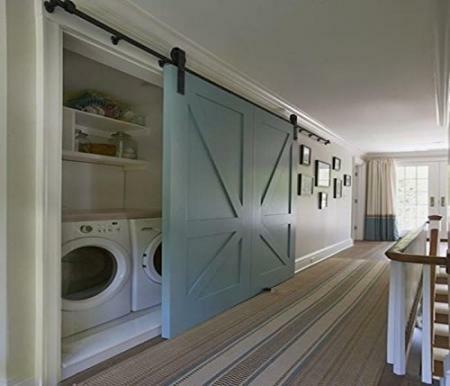 This 10' wide pair of barn doors are an excellent choice for a hall laundry closet. The doors can be painted with one of the colors from the decor color scheme. The sliding door hardware used for this design is a classic rustic style. Use this design for any room you wish to create a focal point. The starburst design gives a very dramatic effect that can be played up with stain or paint. You can accent the starburst by painting it a slightly lighter or darker value or even a different color, depending on your room style and design. The combination of four barn doors in a starburst design creates a changing optical look. When the doors are closed, a decided diamond design becomes clear reminiscent of a harlequin pattern. This unique barn door style is enhanced by the choice of a sliding door hardware that features a spoked wheel design. You can use this design in place of any double doors, such as an entrance into a living room, dining room, kitchen or bedroom. The style can be drastically changed by your choice, depending on what you select for the sliding door hardware. For a rustic style, use a stained wood effect. If you are using the doors in a contemporary room, opt to paint the doors using one of the colors from your decor color scheme. 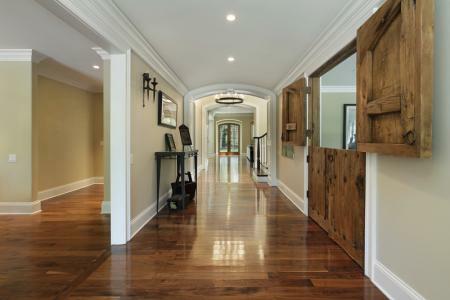 This contemporary home goes all out with a rustic double Dutch barn door style. This is the type of door commonly used for a barn stable. Unlike sliding barn doors, these are hinged directly onto the door frame. The lower portion of the doors feature vertical boards. The upper portion features an inset framing on the inside panel. The rustic look is enhanced with oversized metal rings that mimic those in barns used for tethering a horse in a stable. The Dutch stable style barn doors are a fun way to allow more light into a room while offering a semi-private feel. You can also use these for a children's playroom. The door design will keep toddlers from wandering from the room while allowing you to check on them without disrupting their activities. This style is conducive to a dining room where you may desire a more intimate feel without having a full door closing off the room. The doors look best in this decor stained a medium brown that blends nicely with the hardwood flooring. One of the most popular barn door designs is the simplistic X style. The X is often used over the entire door. It's also used on one half of the barn door, either the top or bottom portion. Some designs place two X designs on a top and bottom panel. 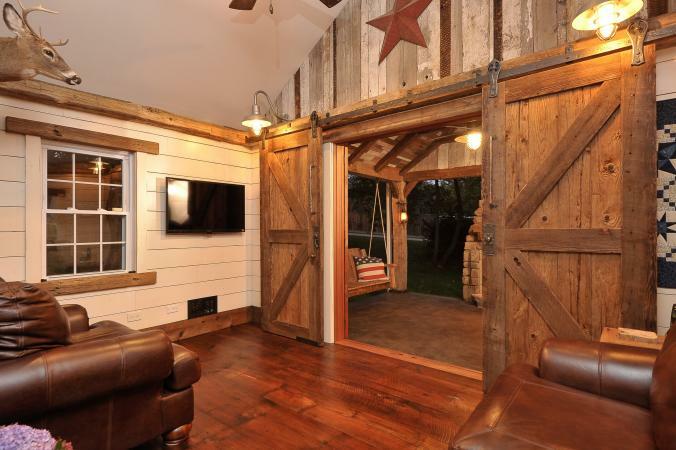 The good news is this barn door design doesn't stop at the double doors to a room or closet. Consider using this design idea for a unique cabinet door. You can purchase a mini sliding barn door and exchange the doors on an existing cabinet. You may decide to transform a two-shelf bookcase into a cabinet. 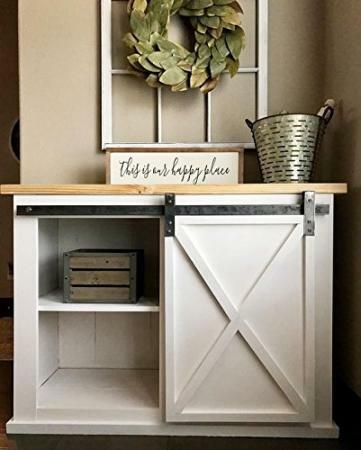 You could also repurpose a dresser by removing the drawers and add mini barn doors for a fun look. Mini barn door track kits can be purchased in different styles and finishes to complete the new look of your cabinet. Taking the X barn door design to a bigger look, these double doors that separate a master bedroom from its en suite bathroom. This home features a wide door expanse. The X design takes up one-fourth of the lower portion of the door with the top panel comprised of several vertical wood slats. Realistic barn door handles complete the look. Not every home has double doors, but you can use the X design on double doors or on a single barn door style. You can use any variation of the X design for your doors. 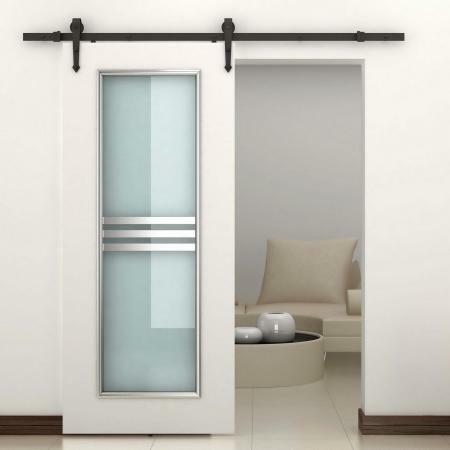 Replace a single bedroom door with the X barn door. An X barn door on a bedroom closet is a nice design addition to your decor. A hall bathroom single door can be transformed by an X barn door style. The chalkboard barn doors feature a center insert panel that's a chalkboard. This design can be a fun and offers several applications for any home style. You can select a sliding track kit that will go with your interior décor. This photo shows a black rustic sliding track that has an industrial utilitarian style. The most obvious room for this type of barn door application is a child's bedroom or playroom. This door may be a design solution where wall space is limited and a chalkboard impractical. 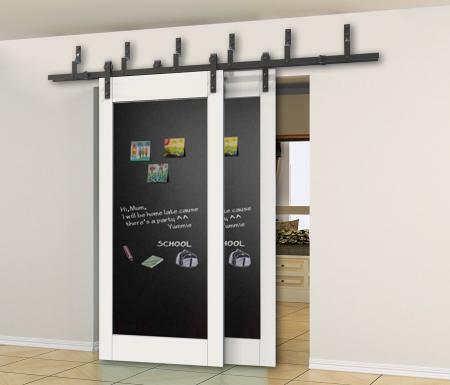 Replacing a bedroom or closet door with a chalkboard utilizes a space that typically doesn't serve a dual purpose. This door design is perfect for a kitchen pantry where it can become a family messaging center or a running grocery list. 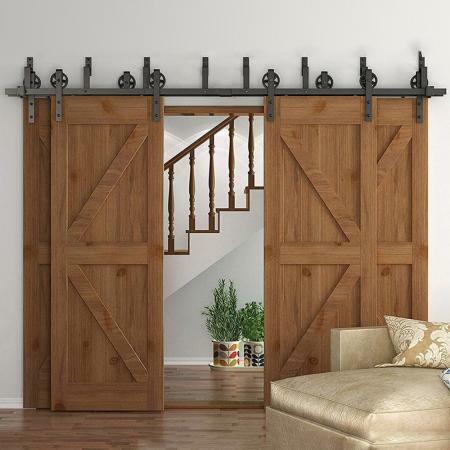 There are many choices for a barn door to use in your home. You can replace an existing door with this design for an instant design statement.